The shoe brand is the star of the latest viral challenge. Here is how it's responding on Twitter. Vans is rating the way people are throwing its sneakers as part of the latest viral challenge. 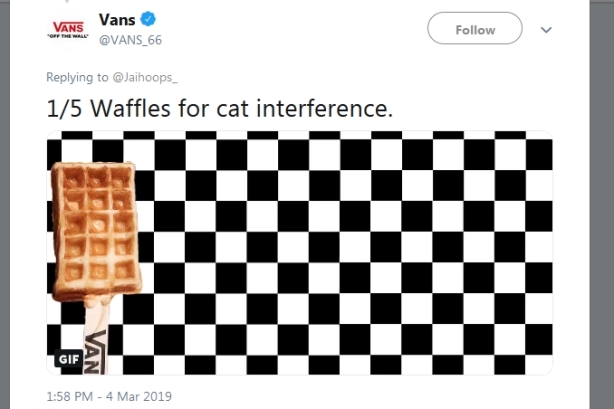 Twitter user @Ibelievthehype created a video on Saturday claiming that Vans sneakers will always land face-up when you throw them. Other users have followed suit by tossing their own skate shoes into the air. On Monday afternoon, Vans started directly replying to videos people taking part in the challenge posted by rating each throw with waffles. Vans representatives were not immediately available for comment.